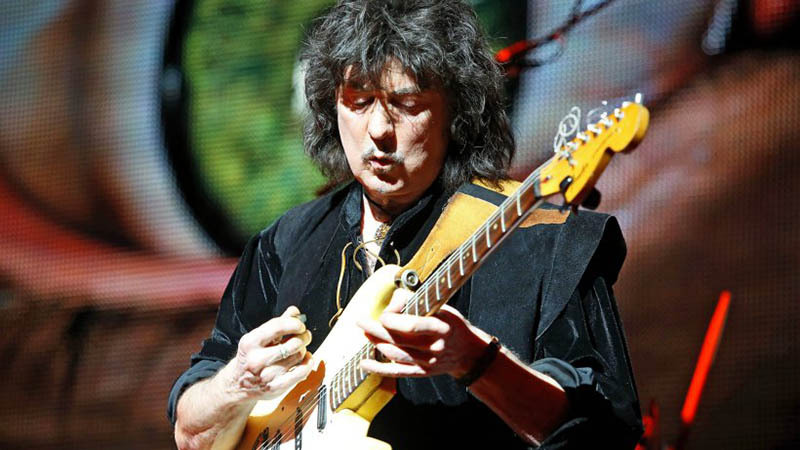 Ritchie Blackmore showed his virtuosity in the Velodrome. Huge green eyes stare into the audience from the stage, the pupils have half a meter in diameter, in front of this gigantic projection Ritchie Blackmore stands with his band. Ritchie Blackmore, the man who wrote the memorable guitar riff for Deep Purple's "Smoke on the Water" before finally leaving the band and starting his own project with Ritchie Blackmore's Rainbow. As one of the first songs the band plays the Deep-Purple cover "Mistreated" in the Velodrom this evening. The band, which broke up twice since it was founded in 1975, has been active again since 2015. 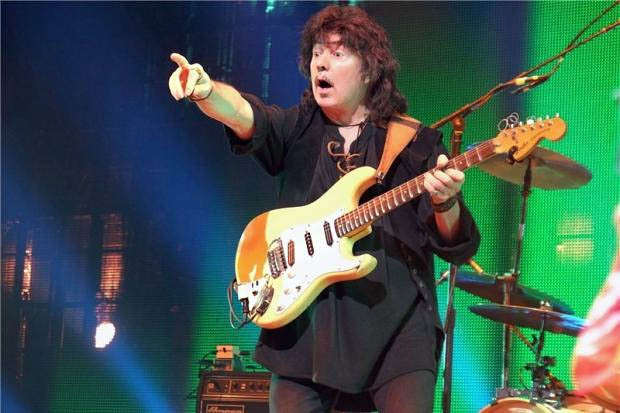 On stage is a complete reformation around the only permanent band member Blackmore. 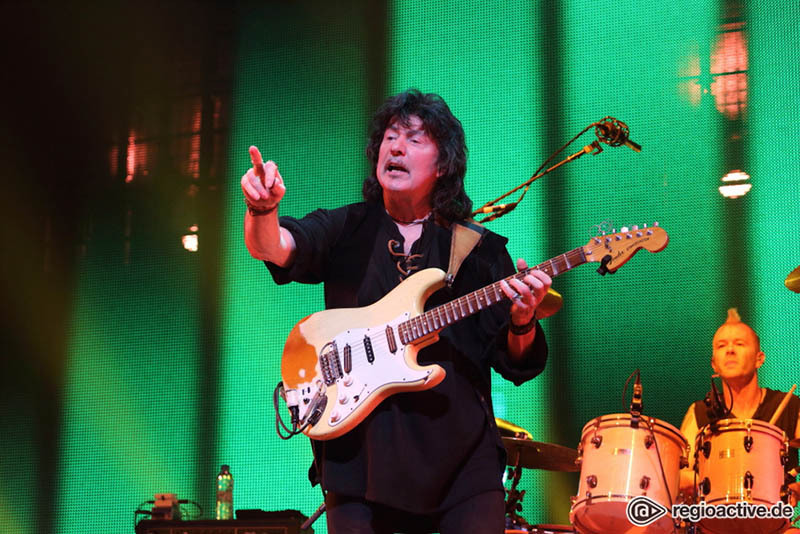 During his guitar solos in "Mistreated" Blackmore gets applause for individual notes, but not all band members have such easy time with the audience. When singer Ronnie Romero invites the audience to sing in his place, only inarticulate screaming follows. Briefly Romero puts his hand to his forehead, then it goes on. The projections on the back wall of the stage sometimes show text animations, sometimes appealing graphics of rainbows in space, but most of the time are abstract shapes in all conceivable colors to see, reminiscent of Windows screensavers. Ritchie Blackmore plays almost on routine his solos, although these are not quite as exuberant and virtuoso as on concert recordings from the seventies, but you can not blame the 73-year-old. During the song "Soldier of Fortune", the Chilean singer Romero once again tries to make the audience sing along, but when he holds the microphone in the crowd, it just answers with a yell of screaming. The band continues to play, strikingly often you can watch drunken people fall to the ground as the music speeds up. But they all get up again, shake each other for a short while, gouging their fingers in the air to signal that everything is alright, and keep dancing. No wonder hardly anyone sing along in the right places. Unlike Romero Blackmore has the audience completely in his hand, during the song "Black Night" the crowd sings the relevant guitar riff so loudly that the band cheerfully leaves the stage and only after about a minute get back on. This is followed by an interpretation of Beethoven's 9th Symphony "Ode to Joy", which contains a seemingly endless solo by keyboarder Jens Johansson. Then the band plays the hit "Long Live Rock'n'Roll", and finally Romero gets many-voiced support from the audience. "You can sing, at last," the singer calls into the microphone. At the latest, when the band plays "Smoke on the Water" a short time later, the whole hall sings, and they are happy with Romero that he still manages to win the audience's votes. With the new live album "Memories In Rock II" Ritchie Blackmore brings centuries-olds and virtuoso solos to Berlin in the Velodrome. He shows himself approachable and with a well-rehearsed band. But he does not dare to approach the first new song in over 20 years. There is no doubt that the concert evening is completely dedicated to (very) old rock music. While other bands prefer to play new fresh bands as their support act, The Lords opens for Ritchie Blackmore's Rainbow in the Berlin Velodrome. Even the Rolling Stones have fewer annual rings. Stage announcements begin with Leo Lietz, Jupp Bauer, Bernd Zamulo and P.J.M. Seminara like this: "50 years ago we wrote a song ..."
At least the organizer does not respect old age. Unannounced, he shifts the stagetime for half an hour forward. Even later, the hall is not bursting at the seams, but The Lords begin their set to a truly sad small pile of early arrivals. When the band finishes the regular part of their performance at the originally planned start time of 8 pm, it is luckily a bit cuddlier in the audience, but after an encore hardly anyone shouts of confusion. Nevertheless, the musicians return and sing "Glory Glory Hallelujah". At least now the spark jumps over. The one everyone is waiting for can then take their time. For a good three quarters of an hour, the audience has to make do with another guitar messiah: Jimi Hendrix sounds out of the speakers during the break. Eventually, however, the lights go out and an atmospheric searchlight light show plus "Land Of Hope And Glory" from tape played by Blackmore. He welcomes his audience unexpectedly warmly: As soon as he stepped through the backstage curtain, he kneels for the first time on the edge of the stage and makes contact with his fans. Later he will go to handshakes, but first there is "Spotlight Kid" and "I Surrender". That means: game mode. 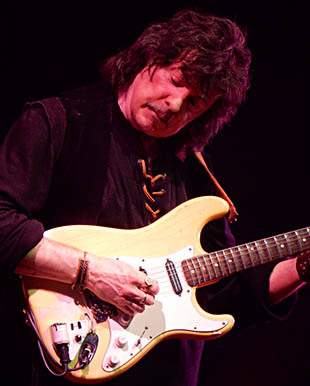 Blackmore falls into his typically casual-bored fingerboard look. Motions he leaves to singer Ronnie Romero. He has the necessary presence and voice to entertain a tens of thousands of venues, but he also has a feeling that most of the viewers have eyes for the man, who is usually slightly behind him. Romero proved in 2016 that he can fill the big footsteps of his well-known predecessors. 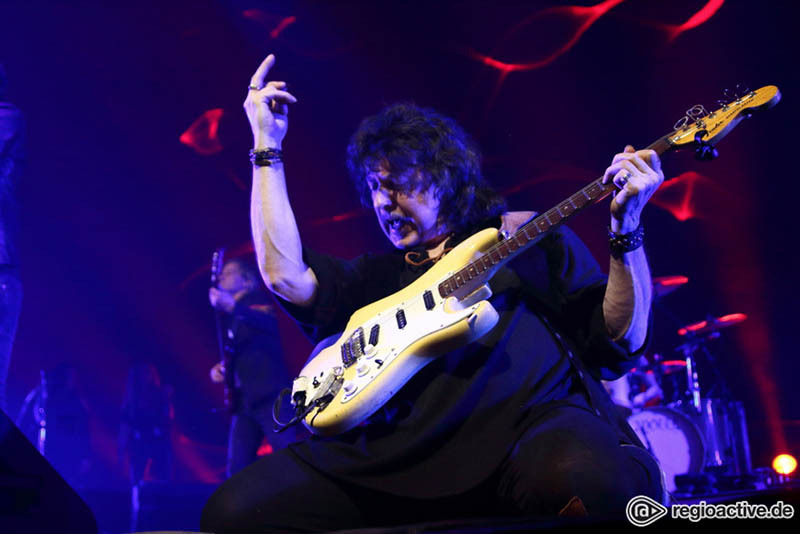 Today, the first endurance test is already waiting for song number 4: After Blackmore flared his characteristic blues licks in "Mistreated", he started "Since You Been Gone". Romero exists with waving red flag band on the right thigh. He also masters the following Dio-showpiece "Man On The Silver Mountain". After the groovy Deep Purple semi-ballad "Perfect Stranger" Blackmore switches to the acoustic guitar. It should be "Soldier Of Fortune". This is the first time in the evening, too clear signs of wear: Although the great dynamic increase of the number still works through the good interaction of the band, but the intimate imaginary beginning with Blackmore and Romero in a cozy togetherness on a dark stage gets tired today. That's when it comes down to two numbers with a long jam part: "Black Night" and "Difficult To Cure". Especially "Black Night" reminds us that one of the most influential figures in rock history is on stage here. This is also apparent to the soundman, because meanwhile Blackmore's guitar sounds so loud that neither keyboarder Jens Johansson nor Romero on the mic reasonably arrive against it. However, the magical effect of the world-famous riff does not seem to cloud it, so that it continues loudly through the throats of the fans, while the band can disappear without too much attention or further guidance from the stage. In addition to his iconic riffs, Ritchie Blackmore is also known for virtuoso solos. In a rush of speed he plays with his 73 years now (four days before the show he celebrated his birthday) no more; Also, his lead game was before a lot more impressing and imaginative. But technical finesses such as two-handed tapping flash over and over again and he still wears his own gentle yet powerful feeling in his fingers. In addition to Blackmore, Johansson plays also extensively solos. In "Difficult To Cure" his fellow musicians leave him a spotlight for several minutes and leave the stage again. Previously, he delivers an amusing duel with bassist Bob Nouveau, who also gets room for a solo in the following song. For as Blackmore waddles along with his oversized setlist panel towards the front row, a few moments later it is clear: it is "Child In Time" turn. The timeless Purple classic then evolves into Romero's masterpiece this evening. Sovereign he conquers the famous harmony vocals in the first section of the song. By contrast, even the subsequent "Rising" opus "Stargazer" fades. The final double "Smoke On The Water" / "Burn" turns out to be less fiery than its content. Although the most famous riff ever written is a powerhouse itself, it reveals clear deficits against Blackmore's ex-colleague Deep Purple. Ritchie Blackmore's Rainbow looks like a cover band in comparison - albeit with a star guitarist. What a pity that Blackmore does not counter this coverband status with the first new Rainbow song for over 20 years. After all, he released on the occasion, published on 6 April, the live album "Memories In Rock II" with the brand new track "Waiting For A Sign". One wonders why he excludes this track on this tour. Alone, because Romero proves his abilities beyond his Dio / Bonnet / Turner / White replacement role in this song, the track deserves a place in the setlist. Maybe Blackmore prefers to write a complete album around this new song right away and tour again. Hope allowed. Let's just wait for a sign. The coolness of a rock band was always readable, how long they let their fans wait at the concert. For example, Pete Doherty came to Berlin shortly before one o'clock on stage. But things in rock have changed. Today you usually start on time, which especially the oldest in the audience expects. Ritchie Blackmore, 50 years in the business and creator of the world's most famous guitar riff, makes it different again. He wants to start the only German concert of his band Rainbow on Wednesday in the Berlin Velodrom just half an hour earlier, which is why the opening act The Lords has to get out earlier. At the end of the day Rainbow will come on stage as planned at 9 pm and nobody knows what that would be like. Maybe Blackmore has finished his drink in peace, because on stage he is always a little bit puzzled, as he reported recently. Anyway, he does not care what people think about him anyway (see also his medieval music project Blackmore's Night). He has already pulled his boots through at Deep Purple, where there was always trouble, especially with singer Ian Gillan. That's why he founded his own Rainbow band in 1975 and led them through the decades with dozens of band members on the hire-and-fire principle. But that is less important than before, because in principle, the fans come only because of Blackmore and in the hope that he plays as many Purple hits as possible. Even those who Deep Purple do not play anymore, because singer Ian Gillan does not want to sing out of stubbornness or because he does not come up with the vocals anymore. Which is not a problem for the young Rainbow singer Ronnie Romero, a Chilean. By the way, he also earns a Spartakiade medal for the discipline classic Rockstar posing, which is his boss, who finds such behavior rather ridiculous, but also banana. He stands in his corner or in front of the drums and plays his guitar. As hoped by the approximately 7,000 fans, he agrees in addition to Rainbow hits such as "I Surrender" and "Since You Been Gone" also plenty of Purple music, from all phases of the band: "Mistreated", "Perfect Strangers", "Black Night "- all without alienation, as Robert Plant does in his concerts with old Led Zeppelin songs. In that sense, today's Rainbow are more like a Purple tribute band with a Purple original member. A look in the round in front of the stage, however, leaves no doubt that the fans of Blackmore's couldn't-care-less attitude are included. The heads, that are still present, scream, the beer sloshing in the cups, and the eyes roll blissfully. Only one thing missing: The monster riff of "Smoke On The Water". It comes, unprepared, because the vocal lines from the vocalist begin with the introduction before Blackmore smashes the most famous guitar riff in rock history onto his steel strings. It roars through the hall, in which all sorts of air guitar players fall into disarray. And then Ritchie Blackmore just stops in the middle of the song and leaves the stage. That would have been a pretty cool final act. But such double bottom things the 73-year-old does not shears. So he comes back and now plays with his band "Burn" and "Child In Time", which drives the vocals in the audience again to new heights. Oh yes, in between there's Beethoven's monster reef from the Ninth, which Blackmore has retired to the instrumental title "Difficult to Cure". Cheesy, but that's just how he is, that's Ritchie. He can do everything, and does everything. Despite Ritchie's reluctance if he will give anymore concerts on our mainland, we (Theo Feldman, Ron Leder, Wim Weijts and I) were honored to see Rainbow at work in Berlin. Beforehand we had already heard from Wim Weijts, who was also present in Helsinki, that Rainbow was doing well, only they did not play an encore there. The cause was probably an inappropriate comment from the bassist Bob who wanted to put Ritchie in the spotlight he apparently had no appreciation for, resulting in no encore. Nevertheless, I drove to Berlin in good spirits. The atmosphere was very good and there was a lot of attention at the futuristic Velodrome early in the afternoon. As a support act Ritchie had invited 'the Lords' who only played old Rock' n Roll. Finally, after the introtape of Ritchie's own version of 'Land of Hope and Glory' at 21.10 hours, Rainbow started a two-hour show that was filled with only real Memories of Rock, highlights from the first Rainbow / Deep Purple period. It is also not possible to play everything because they would have to fill three evenings. Despite the promise to play more Rainbow songs, six Purple songs were played. Personally I would have liked to hear more Rainbow songs like Ariel, Catch the Rainbow, Black Masquerade or Still I'm Sad. The band opened with the well-known 'Spotlight Kid' followed by 'I Surrender'. Ritchie looked very relaxed and was immediately in his element. Ronnie also did his best to made the fans enthusiastic immediately. The stage was equipped with a life-size video screen on which the album covers of Rainbow were to be seen. The third song 'Mistreated' was used with a short introduction. Here it was clear to hear that Ritchie was no longer looking for speed in his solo but was making the melody sound more. This will undoubtedly have to do with his fingers that have suffered joint wear after 73 years. Nevertheless, he plays his songs with ease. With the Down to Earth background 'Since you have been gone' was used. Then came the song written for Ronnie, 'Man on the Silver Mountain'. I keep in mind that with this song Ronnie has convinced Ritchie to choose him as a singer. Ronnie performs all Dio songs perfectly with the right passion that makes you feel like a fan like Dio is still there. Despite all the criticisms on this line up, we must be grateful to Ritchie for seeing Rainbow live. As I wrote, there was also a lot of Purple material to hear. So 'Perfect Strangers' and 'Smoke on the Water' were not skipped. Songs that were also always discussed in the real Rainbow period. Blackmore without the riffs of Smoke means the concert is not complete. This time also no tribute to Jon Lord but 'Soldier of Fortune' which Ritchie played entirely acoustically with the whole hall singing along. Nice to hear and goose bumps when this song is played. Ritchie continues with his own version of the masterpiece of Beethoven's ninth, 'Difficult to Cure', after which he starts a sing-along 'Black Night'. The audience sings along with them in full chest. The wish of the 'All Night Long' thought makes you dream that the evening will remain infinitely long. Although I missed Graham's voice here, the mood was right. This song was followed by 'Child in Time', a song that Ronnie also sing with passion. Eventually the tones of 'Stargazer' were used and the Rising background appeared. You immediately felt in higher spheres as the magic of Rainbow was in its early years. As if it was not possible, 'Long Live Rock' n 'Roll' was done and a beautiful blue pen drawing of the Long Live Rock 'n Roll album cover appeared in the background. In contrast to the futuristic 'rainbow' background from 2016, the video wall with the various album covers made you feel like you were watching a 1977 concert. The show ended with 'Smoke on the Water' and after a short break 'Burn' was played as an encore. After more than two hours the hall lights went on and we were back on the ground with both feet. We had another 'Memory of Rock' that can not be taken away. The line up played significantly better than in 2016. The band is better used to each other. Although I can not stop myself from saying that a reunion with the old Rainbow members like the Michael Schenker Fest did was probably better. In the end, Ritchie does not call it Memories of Rock for nothing, right? Although the master does not look that dynamic anymore, he still manages to give his fans an unforgettable evening. Now the question remains: does he come back again? ...... Maybe Next Time!